Black Gloss Plinth with Art Deco Style detailing to hire. This plinth is finished in a gloss black acrylic giving it a crisp reflective surface without the cumbersome weight of glass. This furniture hire item would be perfect for any number of themed events. Also available in a plain black finish, plain mirrored finish and plain white. Black Gloss Plinth to hire. 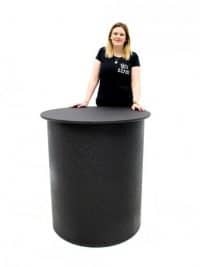 This plinth has a lovely gloss black finish, giving it a crisp reflective surface that would look fabulous at your event or party. This is a really versatile furniture item, that would be perfect for any number of themed events from Art Deco to Nightclub, and anything in between! Also available in plain mirrored finish, plain white or Art Deco themed. Please note that it is possible to customise this item; simply speak to one of the sales team for details. 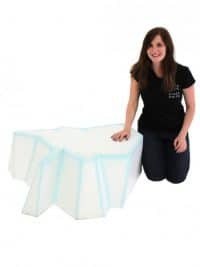 Lightweight, so easy to move about and position at your event, our small Iceberg Plinth will look fantastic at any Winter, Titanic or Ice themed event or party. 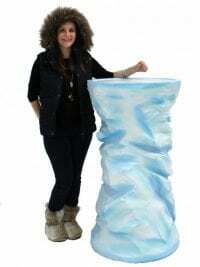 We have a larger size too so why not hire them together to create a truly icy scene. Black Plinth (1m) to hire. 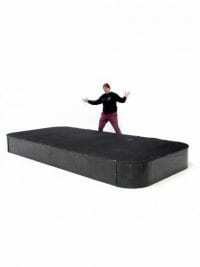 Suitable for use across any theme; this black plinth is ideal for use to display virtually anything! 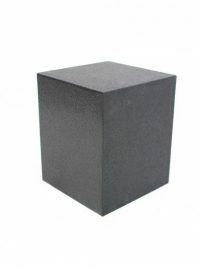 Take a look at some of our other black plinths below. Tree Trunk Poseur Table to hire. 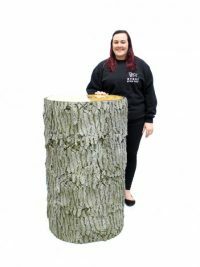 This prop has been handcrafted to create an ultra realistic tree trunk styled poseur table, perfect for a whole range of themes from Jungle to Enchanted Garden or Fairytale. Why not hire some of our stools too; some ideas are pictured opposite. We also have ultra realistic Tree Seating Booths and Tree Stump Tables for hire. Please note that the rental price is for one poseur table only. The stools are pictured for inspiration only and are available to hire separately – see below. 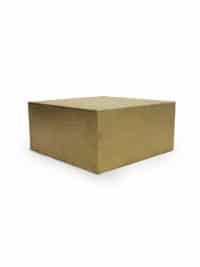 Low Gold Plinth to hire! Suitable for use across any theme; this low gold plinth is ideal for use as a low pedestal under table centres (as demonstrated by our Gold Candelabra opposite). 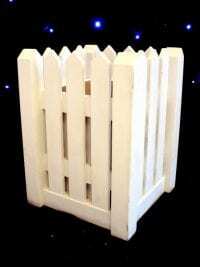 If you require a a black version of this plinth we have one available under code SN2235. Suitable for use across any theme; this black plinth is ideal for use as a pedestal under table centres. 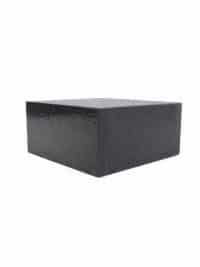 If you require a low black plinth we have one available under code SN2235. Low Black Plinth to hire. Suitable for use across any theme; this low black plinth is ideal for use as a low pedestal under table centres (as demonstrated by our Silver Candelabra opposite). 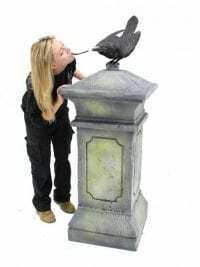 If you require a taller black plinth we have one available under code SN2236. Chunky Wood Coffee Table to hire. This beautiful table is the perfect item for use across any number of themes. So whether your event is themed as Africa or Apres Ski, choose this table, along with some of our event furniture, and your event will certainly be dressed in style! This table is on castors so will be easy to manoeuvre at your event. 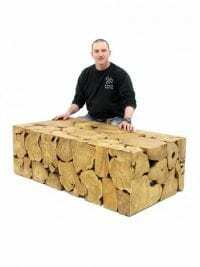 Rustic Tree Trunk Coffee Table to hire. This beautiful table is constructed from a number of tree trunk slices and polished to create a simple yet elegant furniture solution; the perfect item for any number of themes and an item that will definitely add that touch of class to your event or party. 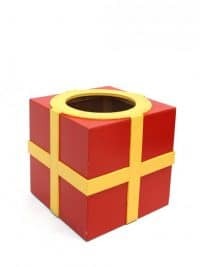 Use on its own or with our matching plinths or cubes, which we have in several different sizes. 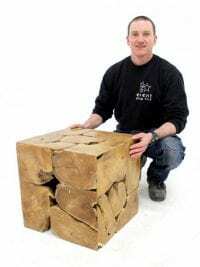 Rustic Tree Trunk Cube to hire. 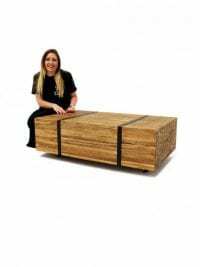 This beautiful cube is constructed from a number of tree trunk slices and polished to create a simple yet elegant furniture solution; the perfect item for any number of themes and an item that will definitely add that touch of class to your event or party. Please note that the product is pictured opposite with our Twig Side Table & Stool for inspiration and that these products are available for a small extra charge. Rustic Tree Trunk Plinth to hire. 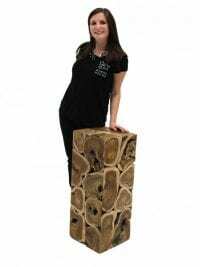 This beautiful small sized plinth is constructed from a number of tree trunk slices and polished to create a simple yet elegant furniture solution; the perfect item for any number of themes, and an item that will definitely add that touch of class to your event or party. Use on its own or with the matching plinths of different sizes (FUR367 & FUR391). Please note that the rental price is for one plinth only. 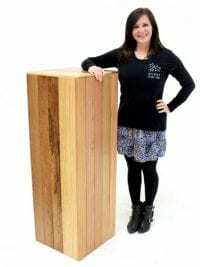 Plank Wood Poseur/Plinth to hire. Crafted in our workshop, these plinths would look fantastic in many different themes from Industrial to Farm, or from Pirate to Caribbean. They are completely versatile; suitable for use as a poseur table, as a display plinth or simply to help set the scene, whatever your theme! Cedar Wood Poseur/Plinth to hire. 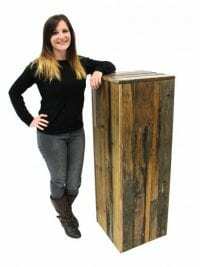 Crafted in our workshop, these high quality cedar wood plinths would look fantastic in many different themes from Industrial to Farm, or from Pirate to Caribbean. They are completely versatile; suitable for use as a poseur table, as a display plinth or simply to help set the scene, whatever your theme! We also have a beautiful cedar wood bar to hire – take a look here. Cast Iron Pot to hire. This lovely reclaimed pot suits so many different themes. Use it to dress an industrial scene, create a witches lair or a pirate hideaway; the options are endless! 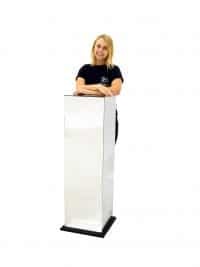 White Gloss Plinth to hire. 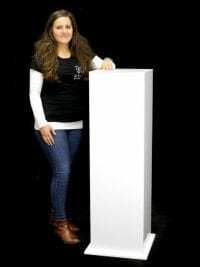 This simple yet elegant plinth would look great at lots of different events; so whether your theme is Christmas, Heaven or you just want something simple and stylish for a party or wedding, this plinth will be perfect! 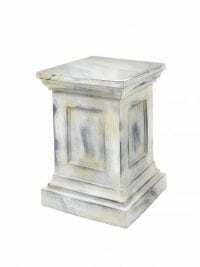 We have other plinths available, please look in our furniture theme. 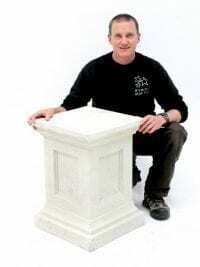 Small White Stone Effect Plinth for hire. This prop is fully 3D and suitable for use on its own or as an accompaniment to our urns or classical statues. Please note this code is for the hire of the plinth only. The urn is available under code SN1347 (see below). 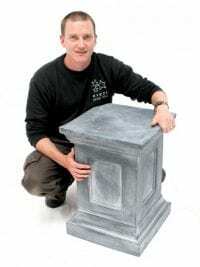 Medium Stone Effect Plinth to hire. This prop is fully 3D and available to hire from us. The plinth is suitable for use on its own or is perfect as a matching accompaniment to our medium stone effect urn, SCN132, pictured here. The total height of the urn on this plinth is 1350m. Please note that this code is for the hire of the plinth only. 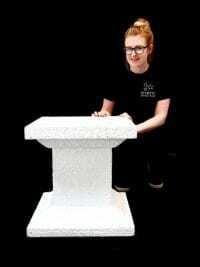 Giant Stone Effect Plinth for hire. This prop is fully 3D and available to hire from us. 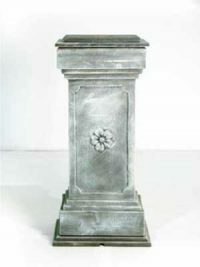 The plinth is suitable for use on its own or is perfect as a matching accompaniment to our Large Dark Stone Effect Urn (SCN130). The total height of the urn on this plinth is 1600mm. Please note this code is for the hire of the plinth only. The plinth is suitable for use on its own or is perfect as a matching accompaniment to our giant Stone Effect Urn pictured here (SCN128). The total height of the urn on this plinth is 2100mm. A lovely ornate plinth in stone effect. Can be used to seat items on such as a street light which we used for the Beatrix Potter London premier or used alone. 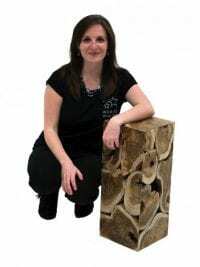 This beautiful medium sized plinth is constructed from a number of tree trunk slices and polished to create a simple yet elegant furniture solution; the perfect item for any number of themes, and an item that will definitely add that touch of class to your event or party. 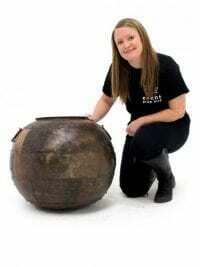 Use on its own or with the matching plinths of different sizes (FUR367 & FUR392). 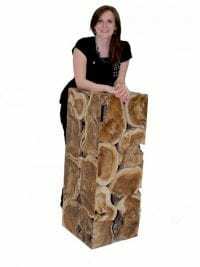 This beautiful tall sized plinth is constructed from a number of tree trunk slices and polished to create a simple yet elegant furniture solution; the perfect item for any number of themes, and an item that will definitely add that touch of class to your event or party. Use on its own or with the matching plinths of different sizes (FUR391 & FUR392). 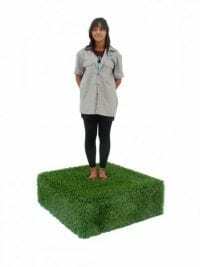 Artificial Grass Covered Plinth to hire. Perfect for anything where you want a bonanza of fake grass covered things like our Grass Covered Chesterfield Sofa, Grass Covered Coffee Table, Grass Carpet Walkway and even, yes, you've guessed it, Grass Covered Daybed. For all your grass needs, we've got it 'covered'. Nutcracker Soldier Plinth to hire. Painted in red and yellow to match our Nutcracker Soldiers, these plinths will raise our already mighty 8ft soldiers a further 2ft! Make sure you hire these plinths if you really want to make the nutcrackers stand out at your Christmas, Winter Wonderland or Victorian Christmas themed party! Please note that the Nutcracker Soldier is shown for illustration purposes and the price quoted is for the plinth only. You can hire the Nutcracker Soldiers via code WWD112. Fairytale Pumpkin on Plinth for hire. Cinders, you will go to the ball……! Our beautiful Fairytale Pumpkin on a Plinth is a stunning prop that would look fantastic at any Fairytale styled event or party. 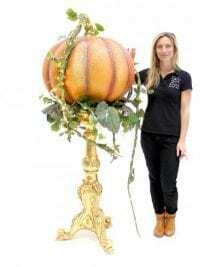 Consisting of a giant pumpkin with trailing ivy and pretty battery powered LED lights and sitting on an ornate gold plinth, this prop will truly set the scene at your event. 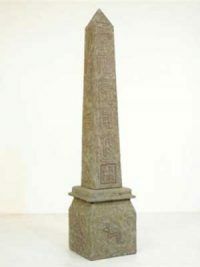 A stone effect egyptian obelisk complete with ancient epyptian hieroglyphics which actually spell something would you believe! This prop is assempled in 2 parts for quick and easy installation. 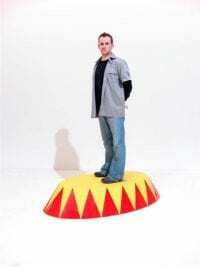 Oval Circus Animal Plinth to hire. Perfect to sit one of our circus animals on. This is available in a larger size to suit both our small and large animals. Please note that the price quoted is for the plinth only; the lion or other animals are available to hire separately. 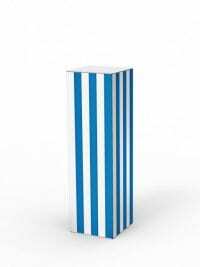 This blue and white plinth will add a classic seaside feel to your British or Seaside themed event or party and will look great alongside our deckchairs & seaside bars. 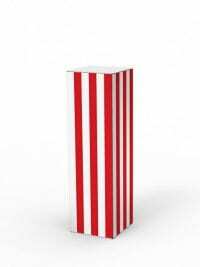 This red and white plinth will add a classic seaside feel to your British or Seaside themed event or party and will look great alongside our deckchairs & seaside bars. 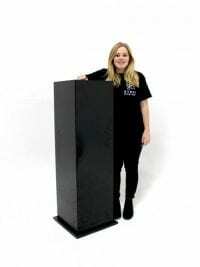 Large black plinth for hire! This large black plinth can be used across almost any theme and to display just about anything from a single item to a collection! It's the perfect size to display our stunning replica Aston Martin DB5 car; a MUST HAVE for any Secret Agent themed party. You can check out more about the DB5 under prop code BND62. Please note that it is possible to add custom graphics to this plinth at an additional cost; please speak to your sale rep for more details.